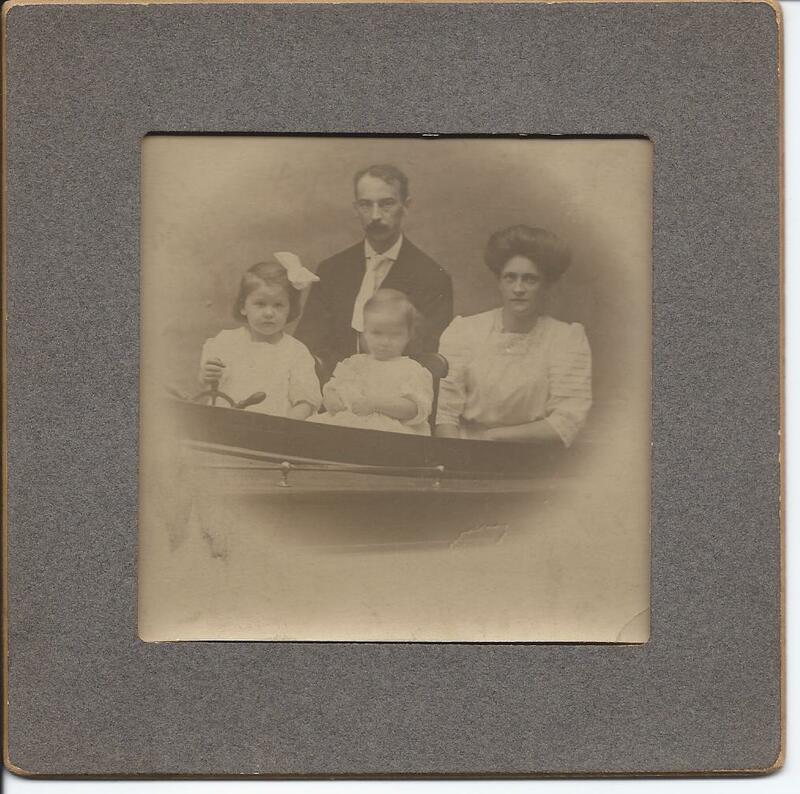 Early 20th century photograph of a family identified on reverse as Harry Newton, Angeline Newton, unidentified older daughter and younger daughter Ella. Sadly, there's no photographer's imprint to give a clue to locale. Researching online, I found a family that might fit this photograph, but I welcome any information or theories from readers. 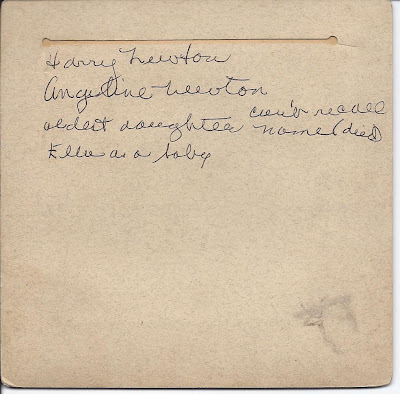 The 1910 Census of the Bronx, New York shows a family of Harry, Angeline, Augusta and Ella Newton. Harry and Angelina were born about 1870 and 1880 respectively. Augusta was shown as a 3 year old, and Ella a one year old. In the 1930 Census, Harry, Angelina, Ella (now with the surname Grunig) and Ella's son Robert were living at Philadelphia, Pennsylvania. Note: As you can read in the reader comment below, Angelina's maiden name was Angelina G. Terwilliger, daughter of Edwin and Anna Louise (Corey) Terwilliger. 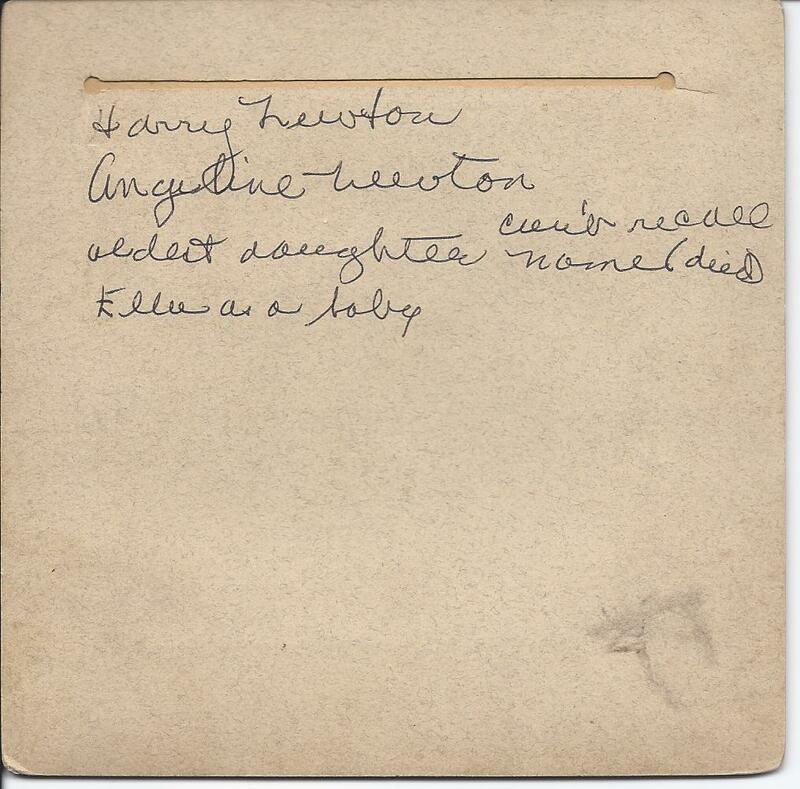 Angelina and Harry Newton married at Manhattan on 13 July 1902. The reader also discovered the date of death for the older daughter Augusta: 12 June 1913 at the Bronx, when she was six years old. If you have a theory as to the identity of this family, if other than the family above, please leave a comment or contact me directly. The inscription seemed to imply that the older daughter died young. I didn't find anything for Robert Grunig after 1930, but I only took a quick look. Thanks, Ed. I'm leaning toward this being the correct family, especially with your added information.